On September 29th, the UWM Department of Chemistry and Biochemistry hosted Bernard Feringa, recipient of the 2016 Nobel Prize in Chemistry and a distinguished professor of molecular sciences at the University of Groningen in the Netherlands. In a guest lecture titled “The Art of Building Small, from Molecular Switches to Motors,” he addressed the 21st century expectation of developing nanomachines and nanorobots powered by molecular robots. Feringa addressed his process of discovery, and personal experiences on his journey into the world of molecular switches and motors. 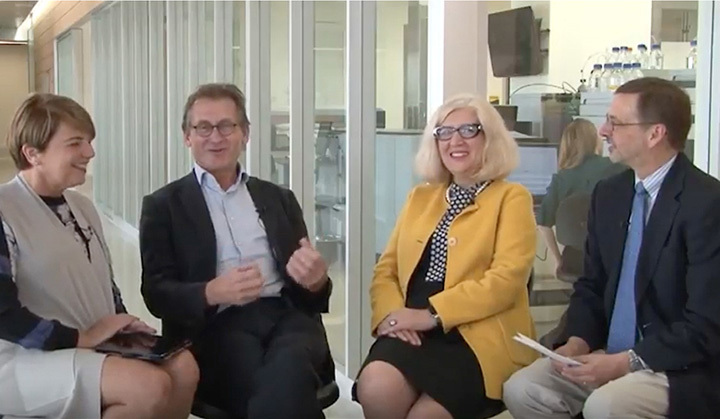 Before his lecture, Feringa participated in a four-person panel discussion, titled “Inspiring Students and Science Education,” hosted by the UWM Graduate School and the Milwaukee Institute for Drug Discovery. Along with Feringa, the other participants were Dr. Marija Gajdardziska-Josifovska, dean of the UWM Graduate School and professor of Physics; Dr. Douglass Stafford, director of the Milwaukee Institute for Drug Discovery and executive director of the Shimadzu Laboratory, housed in the UWM Department of Chemistry and Biochemistry; and WISN 12 News co-anchor Kathy Mykleby. The discussion, held outside the Shimadzu Laboratory at the Kenwood Interdisciplinary Research Complex, focused on how Feringa’s education fostered his love of science and research, and the importance of education in shaping the lives of future researchers who will get their start at UWM.